This page lists all reports that for Latvia including those that involve other countries too. Click here for a list of reports that involve only Latvia. About my cycling through Estonia, Latvia, Lithuania, Belarus and Ukraine to Odessa June 2011. I will write about my cycle experiences. Won't talk politica, economy and other boring things. This page is all about meeting people from different places and to experience local food and culture. I made a trip by bicycle, starting in Gdansk (Poland), and then through Kaliningrad (Russia), Lithuania, Belarus, Latvia, many days in Estonia, Russia (with a stay of 2 weeks in St-Petersburg). My bike needed some maintenance and repair, and I needed to learn some more Russian. From there I cycled along the coast to Vyborg (still Russia) and took a ferry to Finland. From east to west through Finland, and as a final the really nice Aland-islands. By ferry to Stockholm, a few days in Stockholm. By train from Stockholm to Goteborg, and then the last part by bike from Goteborg to Kopenhagen. By train back to the Netherlands. Many experiences in altogether 103 days of cycling. Main accommodation in hotels, guesthouses, B&B's and at many people's homes (thanks to Hospitality Club). A lot of practical information for people who think about cycling in these countries. I can really recommend you to cycle there. Marriage in Tallinn and separation in Riga. After having attended a marriage party in Tallinn my wife and I cycled on to Riga, where we split up. 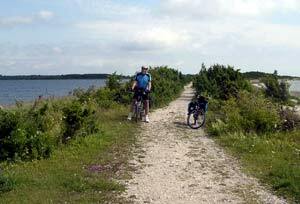 In spite of the flat landscape in Estonia and Latvia the cycle tour was not uneventful. This tour was from started in Tallinn and finished on the coast of Lithuania at Klaipeda. Much of the route was in the ``via Balticum''. Excellent cycling conditions and much to see, enjoy and experience. The Daily Log and Useful Links page includes photos and links. Route maps are included. So viele Nachrichten von der erweiterten EU lassen uns nicht kalt. Unsere Neugier treibt uns - wir buchen die Fähre von Rostock nach Tallinn und starten auf eine Baltikum-Radreise mit offenem Ende. Vieles ist neu und abenteuerlich, die Russisch- und Polnischsprachkenntnissen von meinem Mann - ein Rest aus seiner Schulzeit - erweisen sich als sehr nützlich. Tallinn, Riga, Vilnius und Danzig liegen auf unserem Weg, sowie unzählige spannende Erlebnisse. In 2001 vanuit Nederland vertrokken en nu okt 2005 meer dan 65.000 km en al meer dan 40 landen doorgefietst. Poland and the Baltic states have not yet been discovered as a tourism destination, so we decided to discover the place for ourselves before the inevitable hordes of German package tourists do. We read up a lot on it, primarily from the Lonely Planet guides (not very helpful except for Gdansk and Riga) and the web. We also brought ``Polen per Rad'', volume 1, ISBN 3-932546-11-3, a German-language bicycle guide for Poland that proved essential to find all the sleepy and very scenic and quiet side roads in Poland. Recommended if you understand German - or even if you don't, just for the route maps! Ja, hebben jullie het al gezien, we zijn meer dan 4 jaar onderweg. Wat een tijd en toch.... we genieten er nog elke dag van. Nu zijn we in Jujuy, noord Argentinië. Via Chili gaan we binnenkort naar Bolivia, waar we een tijdlang niet zullen kunnen internetten. We zullen op grote hoogte gaan fietsen, hoogtes waar we nog niet eerder waren. Of dat prettig is.. jullie zullen het later lezen. Of the 65,000 km+/- surface of Latvia about 39 % is covered by forest. Besides there are over 3,000 lakes and 12,000 waterways. Our journey to Saldus gave us a first impression of the beauty of Latvia's landscape: many forests, numerous waterways and occasional little lakes. Estonia has about 1,5 million inhabitants. 450,000 live in the capital Tallinn. Estonia also has dense forests and many open fields. There are not many hills but in return many moraines and far reaching moors as well as extended sandy beaches in many parts of the country. This vastness which we have felt and experienced for a few days had a calming effect on us and besides made us feel a new form of open-mindedness towards the people there and viceversa. I was challenged by a 23 km long chalk and gravelled road before I crossed the border at Subate to Lithuania. Once again there were hardly any road signs. To my surprise the topography started to get quite hilly and the wind started to blow too. I made a break at a lake with wonderful yellow blooming water lilies. I offered some nuts to two passing locals. Shortly afterwards they invited me to stay the night. But as it was very early I politely refused and continued. Just a few kilometres further along I noticed some deer in the meadows. 26 days from 26-6 to 21-7-1998 - Distance 4830 km. - Average speed 21,3 km.t.